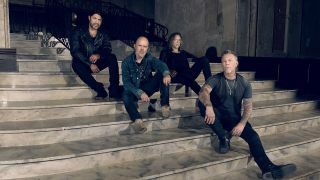 Metallica have announced their second annual Day Of Service, which encourages fans to help out at their local food bank. They launched the initiative in 2018, with this year’s date set for Wednesday, May 22. Like last year, the band will once again collaborate with Feeding America for the the day. Metallica say: “Last year, over 1000 of you participated in our first Day Of Service by volunteering at your local food banks. Thanks to all of you, hundreds of thousands of pounds of food was packed and distributed to those in need – what a way to make a difference in your communities! “We’re thrilled to be back with the details of our second annual Day Of Service on Wednesday, May 22, as we once again invite Metallica fans across the US to join us in volunteering for a day with our friends at the community food banks we supported during our recent North American tours. Metallica report that more than 50 food banks will be taking part in this year’s activities, with each volunteer also receiving an All Within My Hands t-shirt to mark the community drive. A list of participating food banks can be found on Metallica’s website. The band conclude: “Thank you for supporting All Within My Hands and the local organisations we’ve been honoured to assist. See you on May 22 and make sure to use the #MetallicaGivesBack and #AWMH hashtags for a chance to be featured on Metallica.com. Metallica will kick off their European stadium tour in Lisbon on May 1.